Nearly a year ago at this time, our family entered the “political arena” with our son Patrick winning the title of Room Representative for the student council. Well, today, after much stress and work on speeches, our son Bennett won his election for Room Representative! A tradition in our home is using the “Star Plate”. When you have something exciting happen, have a birthday, etc, you get to use the “Star Plate” at dinner. I made it a few years ago at a local make-your-own pottery place. So, the kids like it because there is no other plate like it…special just to our family, and of course, because I made it! 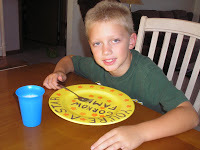 I am sure when they are adults and I am gone, there will be fights over who gets to keep the “Star Plate”! It is a great idea for any family and it doesn’t have to be a plate you make, you can just go and buy a brightly colored or striped or fancy plate and use that as your family “Star Plate”. It is just another small way that I make our kids feel special. So, tonight was a “Star Plate” meal for Bennett….and he cleaned his plate! ← Review: Softlips Organic Lip Conditioner and Giveaway!